Hicks, Edward, 1780-1849. Peaceable Kingdom, from Art in the Christian Tradition, a project of the Vanderbilt Divinity Library, Nashville, TN. Advent liturgy is filled with references to the lion and the lamb image of this text. Isaiah’s promise that God intends peace for both animals and people is as powerful for children as it is for adults. Children, especially those who live caught in the crossfire at home, at school, and in their neighborhood, find deep comfort and hope in this promise. But they need to explore its physical details before they can grasp its message. Show the painting to the children. Help them identify the animals they see in it. Talk about the problems some of those animals have getting along, e.g. lions tend to eat lambs for dinner. If no child notices them, point out the people in the background. Note that when Mr. Hicks painted this picture Indians and white settlers were at war, but that the people in the picture seem to be talking peaceably. 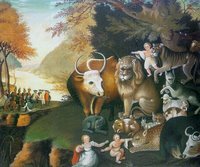 Finally read Isaiah’s promise that one day all animals and all people will get along (vv.6-9 only). Or, after presenting Hicks picture, encourage children to create other pictures of animals that usually don’t get along, being together. Children can put pictures in offering plate, bring them forward to talk to pastor while the offering is being collected, or work on them during sermon, then come forward before the congregation’s prayers to discuss their work and have their hopes added to congregation’s prayers. Light the second candle of the Advent wreath for God’s promised peace. Reread Isaiah 11:6-9 as you light the wreath. Pray for peace at home, at school, at work, in the nation, in the world…. Introduce this psalm as a prayer for kings, mayors, governors, and presidents. If you did not identify prayers for the nation last Sunday, talk with the children to identify prayers for leaders today. Either, gather their prayers into one prayer which you voice with them at the conclusion of the conversation. Or, include their prayers in the congregation’s prayers. The latter is most effective if that prayer immediately follows the conversation with the children. Verse 7 is the summary of this message and the easiest part for children to understand. (The remainder of the text gets involved with circumcision and Gentiles and Jesse stumps.) Verse 7 makes sense on its own. Get along with each other! Present pictures of a variety of very different people (old National Geographics are a good source). Offer some odd pairs. Include some international photos and some pictures of people who could be local, e.g. an elegantly dressed person and a roughly dresses person displaying a tattoo. Ask what would be hard for these people to get along. Close by reading verse 7 from a Bible (perhaps bringing the big pulpit Bible down and reading from it) and pointing out that we are to be friends with all people. If your congregation uses projected pictures, project pictures of unusual looking people during the singing about getting along. Light the second candle of the Advent wreath for Peace Among All People. Pray for people who often do not get along. “Help Us Accept Each Other” is a sing-able new hymn that offers prayers for people working to get along with each other. “Jesus Loves the Little Children of the World” is the only other child friendly one that comes to mind. There have got to be others – right? This year John the Baptist appears on two Sundays in Advent (this week and next). Today’s text focuses on the most difficult of John’s teachings for children to understand. So, during children’s time tell John’s story in terms children will understand using your favorite Bible story book. The Family Story Bible, by Ralph Milton, has a good story about John the Baptist. I’d use only the first half of the story, saving the last half for Baptism of the Lord Sunday in January. This story can either be read directly from the book or used as background for telling the story in your own words. Another way to retell the story of John the Baptist is to pick up a shepherd from the crèche. Present it to the children noting that there is one person who is never in Nativity sets, but really ought to be. He probably looked most like the shepherds. Tell what he wore and ate. Then tell what he did. He called people to admit what they were doing that they knew was wrong and did anyway. He baptized them to show them that God forgave them and would give them another chance. He also told them God was sending someone very special indeed. With that, put the figure near the empty manger just for today. I don’t know any good worship songs about John the Baptist. If you do, what about directing the rest of us to it in the Comments. Thanks so much, Carolyn! I have been a FAN of yours for many years! I look forward to following you on your new blog! blessings! Olearius's hymn "Comfort, Comfort Ye My People," Coffin's "On Jordan's Bank the Baptist's Cry," and Milligan's "There's a Voice in the Wilderness" are three good John the Baptist hymns. They are available as hymn numbers 101, 115, and 120 in up to date translations in the United Church of Christ's "New Century Hymnal" (1995). In the United Methodists' "The Faith We Sing" (2000) number 2089 is Carl Daw's 1989 hymn, "Wild and Lone the Prophet's Voice." Aah! I like all your songs. Because they are all long and include lots of somewhat distinct ideas, I am wondering about using just one verse as a congregational response repeatedly during the early weeks of Advent. The whole congregation could practice it and explore its meaning the first time it is sung. What do you think?